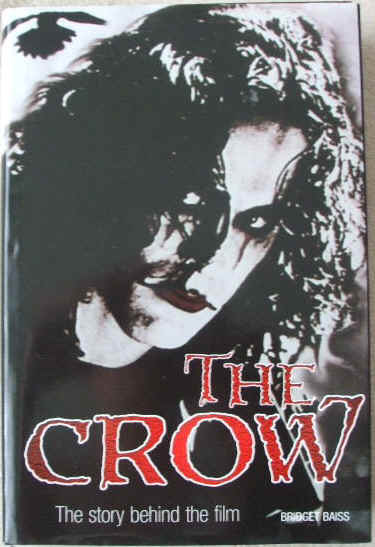 First UK edition, first print hardback of THE CROW The Story Behind the Film, by Bridget Baiss and published by The Making of the Crow, Inc., london, 2000. The book is in very good condition (clean black boards with gold lettering on spine) with some wear to the dust jacket, which is not price clipped (creasing along the bottom of the front cover, half-inch tear to the bottom corner). Internally, the pages are clean and tight and there are no tears and no inscriptions. Based on James O'Barr's classic graphic novel, The Crow is the ultimate cult movie, with a dedicated worldwide following and two sequels, with The Crow 4 currently in production. "On 31st March 1993, while The Crow was in its final days of filming (only eight days were left before completion of the movie), in a strange accident on the set, its 28 year old star, Brandon Lee - son of the legendary Bruce Lee - was shot and killed. But, using the newest digital effects, the movie's producers overcame this personal and financial disaster and found a way to complete the film successfully. So successfully, that when it opened in the USA, it immediately became No 1 at the box office. Since then, 'The Crow' a dark, violent tale of murder and revenge, has become a cult movie. Some people believe that there was a tragic inevitability wrapping together the nature of 'The Crow' and its young star's life and death, and even link it to the earlier, mysterious death of Bruce Lee, Brandon's father. For the first time, The Making of "The Crow", in first-hand accounts, describes in detail the bizarre chain of circumstances which led to the tragic death of its talented actor."